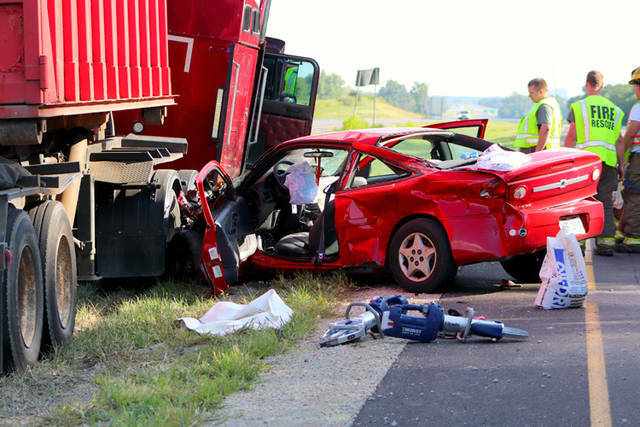 A head-on collision between a car and a semi-tractor and trailer at the intersection of U.S. Route 127 and Kruckeberg Road left three people injured. 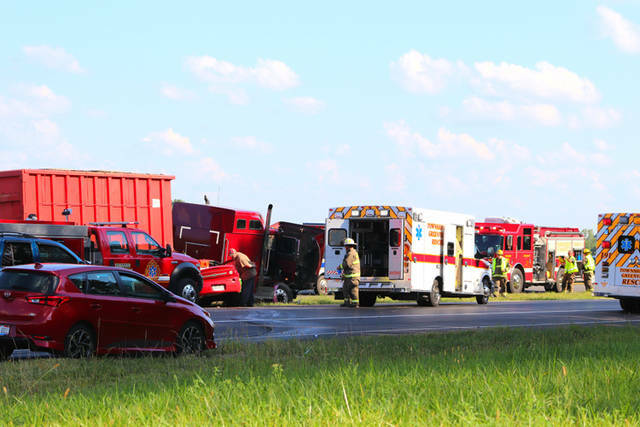 GREENVILLE – A head-on collision between a car and a semi-tractor and trailer has left three injured. At approximately 5:05 p.m. Tuesday, Greenville Township Fire, Greenville Township and Versailles Rescue along with deputies from the Darke County Sheriff’s Department were dispatched to the intersection of U.S. Route 127 and Kruckeberg Road in relation to an accident with injuries involving a car and a semi head-on collision. Arriving units on the scene found a semi-tractor and trailer as well as a car in the center median of the highway with a female driver of the car entrapped. 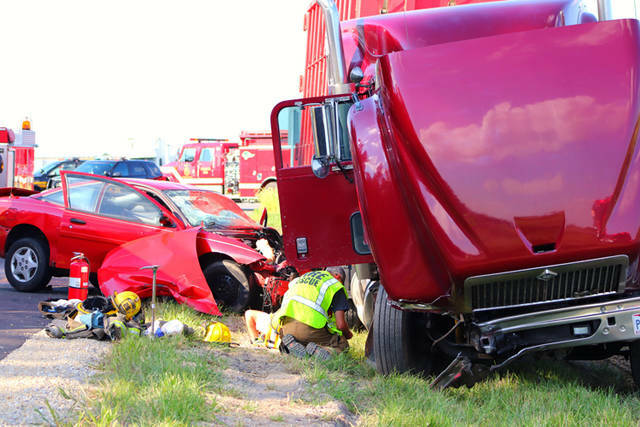 According to the Darke County Sheriff’s Department, a red Chevy Cavalier, driven by 19-year-old Cassie L. Rapier of Union City, Indiana, was eastbound on Kruckeberg Road when she pulled into oncoming traffic, causing a collision with a 1998 maroon International semi-tractor and trailer, driven by 19-year-old Jesse Shaffer of New Paris, traveling southbound on U.S. Route 127. Rapier, the driver of the Cavalier, was mechanically extricated from her vehicle by Greenville Township Fire before being transported along with her front seat passenger, Craig Cable, to Wayne HealthCare by Greenville Township Rescue with non-life-threatening injuries. Shaffer, the driver and sole occupant of the International semi-tractor and trailer, was transported from the scene, also to Wayne HealthCare, by Versailles Rescue with what was described as minor injuries. U.S. Route 127 remained closed for nearly two hours while the accident was investigated and both vehicles were removed from the scene. This entry was tagged crash, Darke County Sheriff’s Department, Greenville, Greenville Township Fire, Greenville Township Rescue, Versailles Rescue, Wayne HealthCare. Bookmark the permalink.